What is WCM’s investment philosophy? World Capital Management (WCM) uses Nobel Prize awarded research by Yale Professor Robert Shiller to identify the world’s most oversold global markets. Professor Shiller’s empirical studies showed stock markets to be inherently inefficient. WCM’s investment portfolios consist of Exchange Traded Funds (ETFs) that mirror the performance of major global indexes. Our objective is to invest in international markets where the potential for appreciation is greatest. We employ proprietary analytical tools to identify markets that point to today’s best investment opportunities. Gary, please tell us about your background? I have a Ph.D. in Aerospace Engineering and have worked for 27 years in Aero Space and Energy industries applying mathematical modeling to different systems from missiles to uranium enrichment. For 10 years I was a contractor at NASA in the area of computational fluid dynamics and aeronautics. I have contributed over 100 published engineering papers, and have two patents. For over 30 years I have enjoyed applying mathematics to investment strategy development. Since 1994 I have also run my own investment advisory firm. Peter Walker, founder of Money Manager Review, and I have partnered to manage money using Professor Robert Shiller’s deeper understanding of stock market valuations. For the past 30 years Peter has been reporting on the performance of hundreds of managers (http://www.managerreview.com/) so he has a strong background in the field of investment strategy and performance. Robert James Shiller: American Nobel Laureate, economist, academic, best-selling author and Sterling Professor of Economics at Yale University. Professor Robert Shiller and Eugene Fama received the 2013 Nobel Prize in economics for improving stock market valuations and economic forecasting. The two are credited with applying cyclical adjusted price earnings to forecast stock market performance. Shiller is also recognized for his prediction of the 2006-2007 housing bubble and his ongoing index of national housing prices. Peter and I realized Shiller’s empirical results were compelling, and with the growth of ETF global indexes, we believe we have found a better way to diversify investments by exploiting global market inefficiencies. WCM’s research endeavors to improve on global market valuations using Professor Shiller’s technical analysis. In short, we believe we have a better way to invest money. Please explain the relationship between earnings and stock market forecasting. Shiller’s research showed that price earnings are the cornerstone for estimating future stock market prices. To prove this Shiller had to redefine how earnings are measured to show the relationship. Obviously, companies are in the business of making money. The profits they make are their earnings and by using current stock prices, the two can be expressed as a price to earnings ratio or P/E. An investor might expect a company with high earnings to offer a better investment value because greater profits are reflected in the stock’s price. However, history doesn’t show an advantage to buying stocks using short-term P/E values. There are 2 reasons for why conventional P/E ratios do not accurately reflect a stock’s future value. 1. Short-term quarterly earnings are too random to gauge future stock values. 2. The relationship between earnings and a stock’s price only become apparent if hundreds of stocks are analyzed over a long time period. Gary, please describe the research behind these results. In 1984, Professor Shiller showed that company earnings are a decisive factor in the market’s future value. To prove this, Professor Shiller had to redefine the way traditional P/E ratios are calculated. Instead of using 4 earnings quarters, he created a new P/E ratio called the Cyclical Price Earnings Ratio or CAPE ratio. The CAPE ratio averages 10 years of earnings (40 quarters) instead of the tradition 4. Shiller also adjusted CAPE ratios for inflation and current bond yields. He then compared CAPE ratios to market prices 20 years in the future. 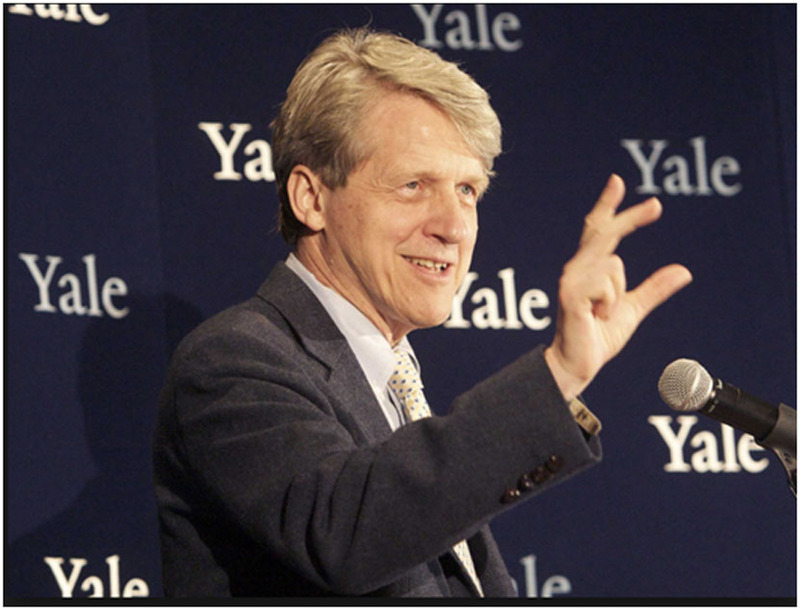 Shiller reasoned that there is too much variability in just one year’s earnings to affect short-term price movements. By using 40 earning-quarters instead of just 4, Shiller effectively removed short-term earnings aberrations. He also chose to analyze the S&P 500 Index because it reflects a statistically greater sample size. To test his idea, Shiller divided 140 years of S&P 500 Index pricing into 20-year segments. He then plotted price performance starting with S&P’s lowest CAPE to the highest CAPE ratios using 5-20 year periods. The results are shown in Figure 1 and validated that stock prices are related to the past values of their CAPE ratios. 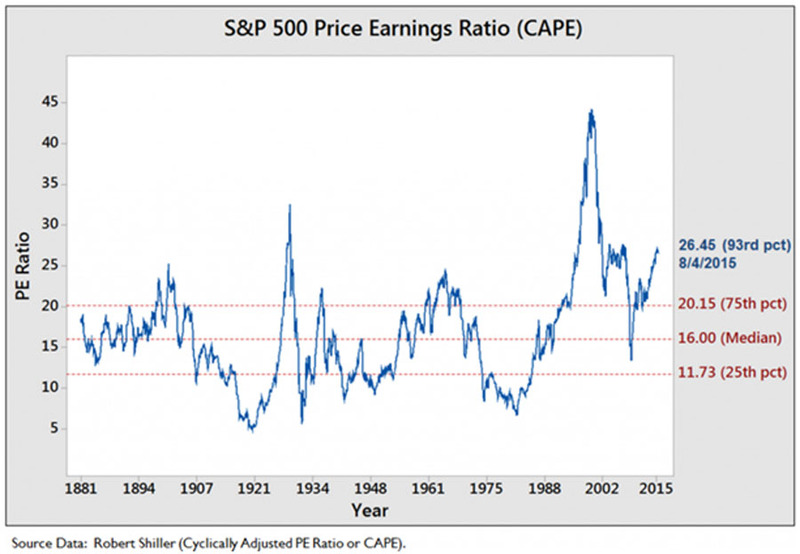 Shiller demonstrated that CAPE ratios are a consistent indicator of future stock performance. Figure 1 results show orange, green dark blue, yellow and light blue arrowed-lines representing 5 market periods. During those periods, the lowest S&P CAPE ratios had the highest returns 20 years in the future. And, conversely, the highest S&P CAPE ratios had the lowest returns 20 years later. Even when divided into discrete time periods, Shiller’s CAPE ratios consistently indicated relative price performance 20 years into the future. Shiller demonstration provides convincing proof that historical earnings play a major role in future stock market values. But to see this relationship it is necessary to look at indexes using long-term earnings histories. By buying the market indexes when the CAPE ratios are below their historical averages, Shiller showed when markets are oversold. And when CAPE ratios are high, it is possible to help avoid bear markets. To see these relationships it is necessary to evaluate a broad index of stocks over extended time periods. Please explain how WCM uses CAPE ratios as an investment tool. 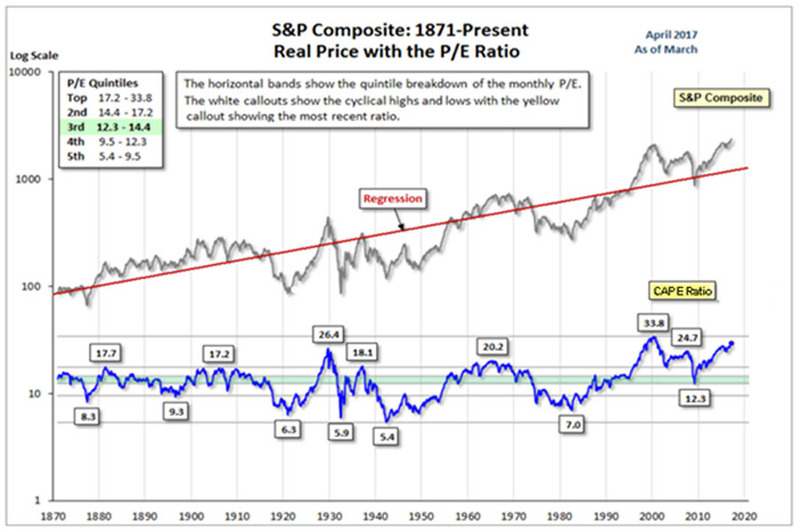 Shiller started by plotting the S&P 500 price performance from 1870 to the present. The graph on the top of Figure 2 shows 140 years of the exponentially expressed returns for the S&P Index with a regression line drawn through the center. Half the time the market has traded below the regression lines and half the time above it. Figure 2: 1871-Present. Upper Graph S&P Composite Price Performance; Lower Graph CAPE Ratio History. 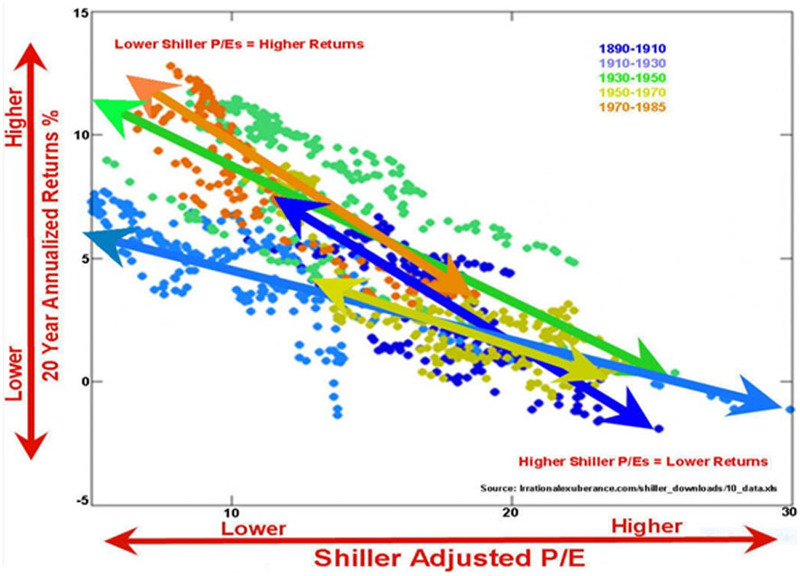 Next, Shiller graphed the S&P’s CAPE ratios and plotted them as shown in the bottom of Figure 2. This plot represents the CAPE changes as a probability distribution over time. The degree to which a CAPE ratio is above or below its historical average gives a measure to the current market’s value based its past history. The CAPE’s most recent number, shown on the right of the plot, indicates the market’s most current market value. Another representation of the S&P’s CAPE distribution is shown in figure 3. In this graph, a more precise historical percentage is shown for the historical S&P Index. This figure again graphs 140 years of CAPE changes as a percentage of its distribution range. The medium CAPE is 16 with lower 25 and the upper 72 percentile being 11.73 and 20.15 respectively. With a recent CAPE of about 30, the S&P is above historical averages. Tell us how your mathematical analysis improves on Shiller’s market forecast? Beginning with the 1990s, market observers noticed that CAPE ratios began trading considerably above their 140-year historical averages. Market pundits argue that higher CAPE ratios may be due to changing economic fundamentals. Possible causes include a dramatic increase in the issuance of stock options, greater concentration of market share due to the Internet, and excess market speculation. Some believe that CAPE ratios are no longer valid as a method in determining market valuations. 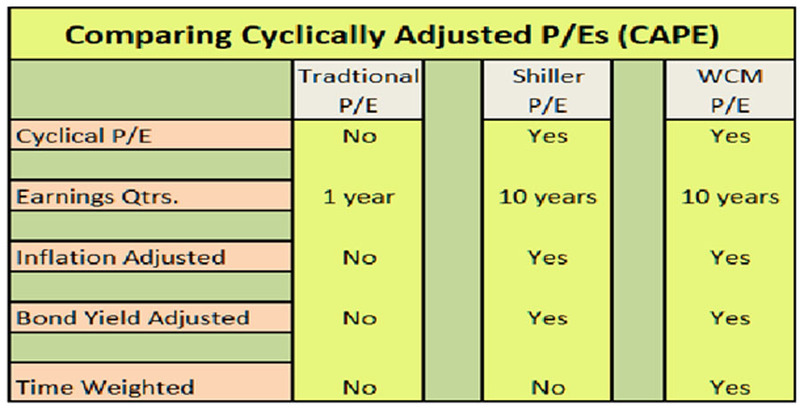 This table above compares tradition P/E, Shiller CAPE and WCM CAPE analysis. In anticipation of possible changing market fundamentals, I have adjusted our investment strategy for market anomalies using mathematics. Shiller’s analysis assumes that the market moves in a linear fashion. The problem with this approach comes apparent when market CAPE averages undergoes a major shift to the upside. Linear analysis uses long term averages that show little adjustment to more recent price behavior. For example, Shiller’s analysis on the S&P 500 index has an average CAPE of 16 (Figure 3) based on 140 years of market data. Shiller’s methodology gives just as much weight to market behavior 140 years ago as to more recent changes. To compensate for this, my algorithm automatically adjust to give greater weight to near term pricing behavior. In fact, the greater the deviation from the historical CAPE average, the greater our system compensates. On the other hand, if the market returns to its historical CAPE average, our analysis adjustments and returns to the long-term averages. Our time and movement weighted adjustments are unique to WCM’s CAPE ratio analysis. We feel this is a major advance on Shiller’s CAPE methodology in estimating market valuations. Why does WCM invest in global markets? Studies show that global markets valuations can also be estimated using CAPE ratios. Figure 4 plots the CAPE ratios between a World Market Index, Japan, Germany and the US. Similar to Shiller’s estimates for the S&P, the relationship between low and high CAPE ratios are clearly evident in this study. Despite having differences in currencies, lending rates, inflation and accounting methods, the underlying use of CAPE ratios turns out to be a good tool for estimating global markets valuations. The economic independence of global markets provides a greater number of undervalued investment opportunities than a single market. US companies represent under 25% of the world’s stock market capital. ETFs indexes are highly liquid and trade in US dollars so it’s easy to diversify assets globally. Figure 5: Comparison of 6 global indexes by CAPE historical ratios using present values. Figure 5 below, compares 6 major market indexes using CAPE analysis. 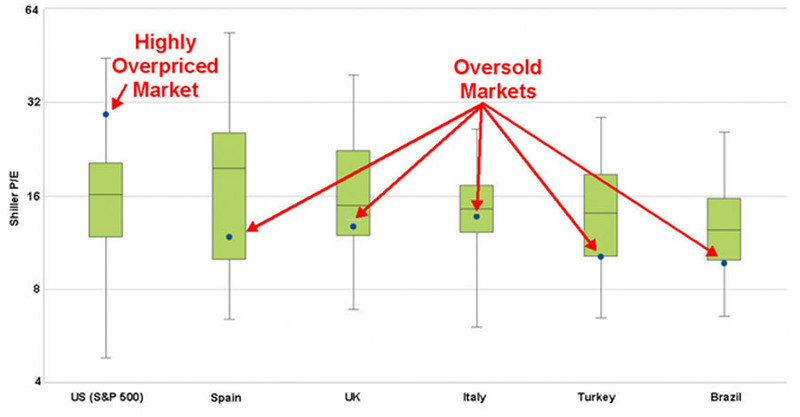 In this example, the most oversold are Turkey and Brazil, followed by UK, Spain, and Italy. The US, seen on the left, is currently valued at above its historical CAPE ratio average of about 30. CAPE analysis gives insight into which global markets to avoid and which global markets have the greater investment return potential. Which global markets does WCM evaluate using CAPE ratios? 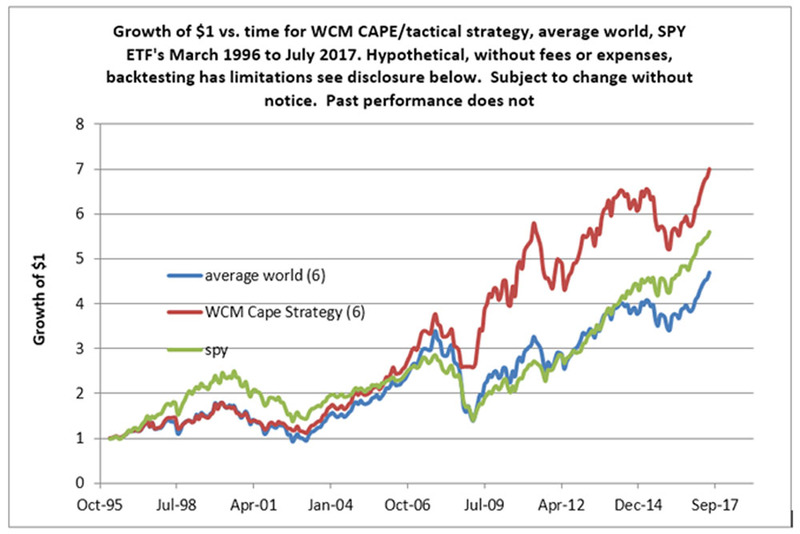 Figure 6 represents the 27 world market indexes WCM currently tracks for their investment potential using CAPE analysis. What numbers do you have comparing CAPE performance to the world index? Shown in Figure 7 is a performance analysis of 13 major global ETF indexes used in our performance study. 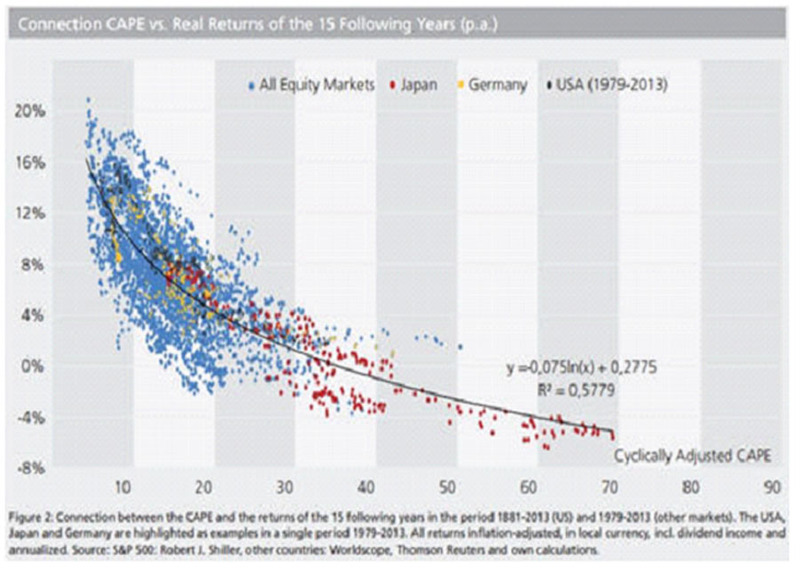 During a 21 year period our analysis showed that undervalued CAPEs performed significantly better than the world index. Disclosure: Results are believed to be accurate and are not guaranteed. The information presented herein is subject to updating, completing, revising, verification, and amendment without notice. Results are gross of money management fees and trading costs. Investors may lose principal in the stock market. The strategy results reflect hypothetical, back-tested results and have inherent limitations including (1) strategy results do not reflect results of actual trading and were achieved by retroactive application of the referenced portfolios with thus use of hindsight, (2) material marketing and economic factors are reflected in comparison with average world (average of 13 single country ETF’s), no expenses, (3) clients may experience materially different results going forward as past performance is not guaranteed. Where else I get updated information on World Capital Management? You can always visit the WCM website at http://worldcapitalmanagement.org/. You can also find us on Facebook. LinkedIn, and Google Plus. You can always call our offices at 415-386-7111 or leave your email address on our homepage and we will send you updates on our firm’s latest performance numbers and news.